This step by step diy project is about how to build a farmhouse nightstand. If you want to learn more about building a rustic nightstand out of common materials, pay attention to the instructions. 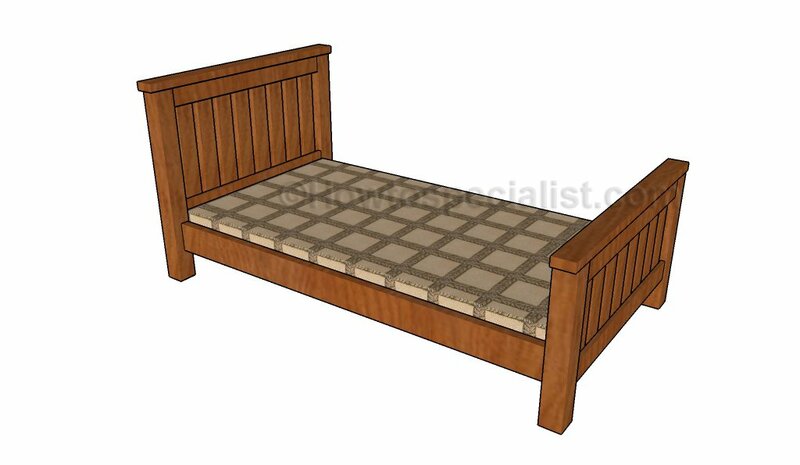 This project is ideal for complementing a farmhouse bed frame. I teamed up with Julian from MyOutdoorPlans for this project. You can see the step by step plans here. You should always plan everything from the very beginning, in order to prevent costly mistakes and to save time. Invest in high quality lumber and plywood, as the components will be exposed to bad weather. Protect the components with appropriate paint or stain. Don’t forget to take a look over the rest of the projects, as there are many inspiring ideas on this site. This inexpensive farmhouse nightstand is made entirely out of 1×4 and 2x2s. If you enjoy the farmhouse look that isn’t always perfect but has a lot of character, you should definitely take a look over these instructions. In as little as an afternoon, you can build this nightstand and save hundreds of dollars. Don’t forget to check out the rest of my projects for more wooden inspiration. The first step of the woodworking project is to build the panels for the farmhouse nightstand. You can use 3/4″ plywood or glue together several 1×4 slats. I chose to use 1×4 lumber to get a more authentic rustic look. Add glue to the joints, align the edges with attention and clamp them together tightly. 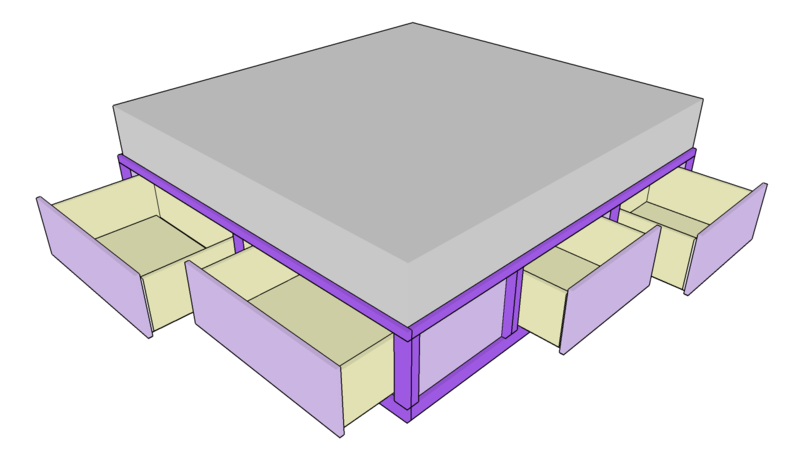 Next, you need to attach the 1×2 supports to the panels. Use glue and 1 1/4″ screws to secure the supports to the panels. Drill pocket holes at both ends of the supports. Afterwards, cut the legs for the nightstand out of 2×2 lumber. Fit the panels to the legs and lock them together tightly with glue. Align the edges with attention and smooth everything thoroughly. Insert 1 1/4″ screws through the 1×2 supports into the legs. Check if the corners are square. The next step of the project is to attach the 2×2 supports to the bottom of the bedside table. Drill pocket holes at both ends of the supports and adjust the height at which you place them according to you needs. Add glue, align the edges and insert 2 1/2″ screws to lock everything together tightly. Continue the project by attaching the supports to the sides of the nightstand. I used 2×2 lumber for the top supports and 1×2 slats for the bottom supports of the drawer, but you can keep thing simple by using 2×2 lumber for all supports. Drill pocket holes at both ends of the supports and secure the to the sides using 2 1/2″ screws. Make sure the corners are square. Fit the other side to the frame of the nightstand and check the progress. The frame of the farmhouse nightstand should look similar to the one in the image. Continue the project by fitting the cleats for the drawer to the inside of the frame. Use 1 1/4″ screws to lock the cleats to the inside of the nightstand. Add glue to the joints and make sure the cleats are horizontal. Attach the 1×4 slats to the bottom of the nightstand. Use finishing nails to lock them into place tightly. Use 1×4 lumber for the frame of the drawer and 1×6 lumber for the front face. Drill pocket holes at both ends of the side slats and secure them to the front and back components using 1 1/4″ screws. Add glue to the joints and make sure the corners are square. Check if the edges are flush before inserting the screws. Cut a piece of 3/4″ plywood for the bottom of the drawer. Drill pocket holes along the edges of the plywood piece and secure it to the frame using 1 1/4″ screws. Add glue to the joints and remove the excess with a damp cloth. Alternatively, you can use glue and brad nails to lock the bottom to the frame of the drawer. Build the tabletop using slats or a piece of 3/4″ plywood. If you use slats, lock them together with pocket screws and glue. Make sure the edges are flush and smooth the surface thoroughly. Drill pilot holes though the top supports and insert 2″ screws into the top. Center the tabletop to the nightstand frame and add glue to the joints. Drill a pilot holes through the face of the drawer and install the knob. Use 120 grit sandpaper to smooth the surface and to dull the sharp edges. Fill the holes with wood putty and smooth the surface thoroughly. Apply a few coats of paint or stain to enhance the look of the farmhouse nightstand and to match it with the rest of the room. See the step by step plans for this project here. Julian did an amazing job with these plans, so don’t forget to check his projects out. Thank you for reading our project about how to build a farmhouse nightstand and we recommend you to check out the rest of the projects. Don’t forget to SHARE and LIKE our projects with your friends, by using the social media widgets, if you want to help us keep adding free woodworking plans.